There's a very wide spectrum of eating disorders; more than just anorexia. Those with anorexia are likely to get help because due to their morbidly thin and skeletal appearance people notice. But if you appear fine and healthy on the outside then people wouldn't take a second look at you and definitely wouldn't think you have an eating disorder. This is why all eating disorders, not just anorexia are fatal. I've always had an awful relationship with food. Ever since I was a toddler, I've been a really fussy eater. 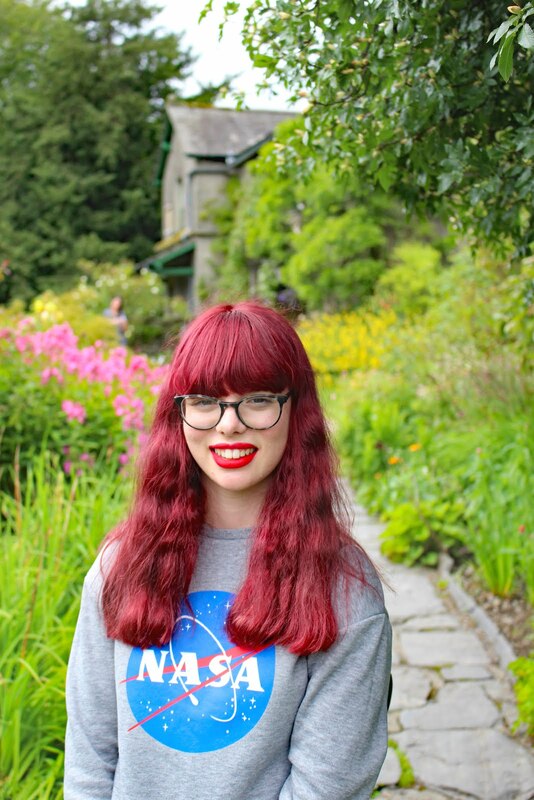 I've struggled with my appearance and weight a lot through secondary school. Although I've presented many of the signs of anorexia, I don't have anorexia. I've never been able to loose that much weight or give up food altogether. I'm not bulimic because I don't and never have engaged in binging and purging cycles. But what I do have is a very poor and dangerous relationship with food and a distorted perception of myself and the way I look. What really upsets me is just like most mental illnesses, EDNOS is never touched upon in any educational environment. Yet it's the most common and the eating disorder that kills the most. I remember learning about anorexia in year 9, at school but there was no mention of bulimia and EDNOS or any other eating disorder for that matter. Young adults (primarily) can be living amongst us battling an internal demon, but because there's no outward struggle, no one takes any notice. If you have a friend that you think may be struggling with an eating disorder it's important to talk about it with them or raise your concern with a teacher or parent. Even if they aren't morbidly thin or maybe they are really overweight, it's vital you do something to prevent the worst from happening. If you don't have a clue what you are looking for, that's okay. 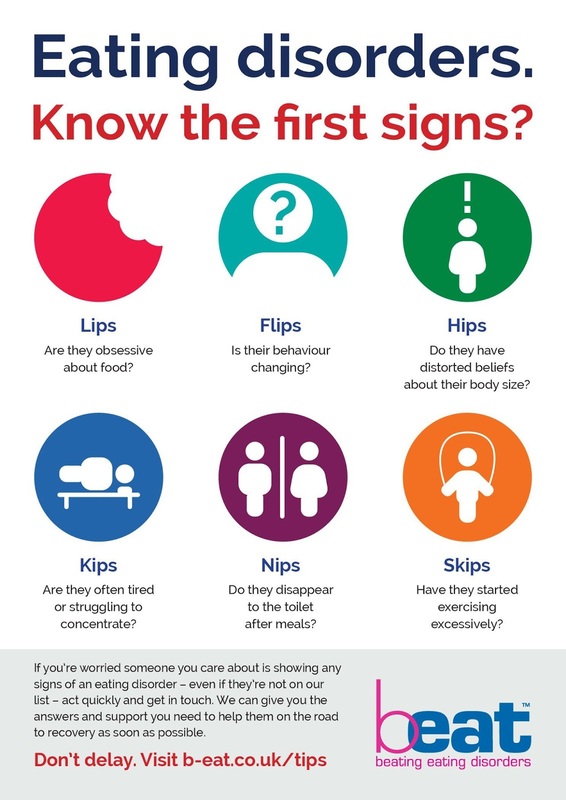 The UK's biggest eating disorder charity, Beat has come up with this easy to remember way of noticing the signs of an eating disorder, not just anorexia. Mood changes- This is probably one of the hardest things to spot. Everyone has mood swings and even if their behaviour does change dramatically it doesn't mean that they have an eating disorder. Lots of other mental and even physical illnesses can result in erratic moods. Do they talk about their weight a lot- This is very common among those with anorexia but also those with other eating disorders. Even people without eating disorders may comment on their physical weight a lot. It's important to say something if you think it's becoming excessive and making them miserable. Tiredness and finding it hard to concentrate- we all get tired, and we can struggle to focus at the end of a long week. If you notice that your friend is tired in the morning, afternoon and evening but refuses to eat anything to get any energy, then alarm bells should start ringing. Obviously, they could be dealing with a physical illness, so just be aware. Going to the toilet after meals- This is a big one for individuals with bulimia, but anyone with an eating disorder can do this too. It may not be to the same extent, but it's important to keep an eye on it. It's better to chat to your friend about it and to find out they have IBS then to let an eating disorder go unnoticed. Exercising excessively- Some people love to exercise. Some just want to get fit and healthy. That's completely okay. What's important is that it is done in balance and moderation. Before and after exercising you need to make sure you are providing the body with the fuel and nutrition it needs. If exercise is taking over their life and they stop doing the things they love because they are spending so much time exercising, it's important to raise your concern. Talking to someone or raising your concerns about someone with an eating disorder is really challenging. You may worry that you will embarrass them by pointing out their odd behaviours. You may not tell them because you've convinced yourself that what they do is normal and it's all going to be okay. If you talk to a teacher or parent about it, they may be concerned that they will hate you and never speak to you again. You know what, that may happen. But you need to remember why you are doing it. For their safety. Eating disorders kill. Eating disorders have the highest mortality rate than any other mental health illness. If you want to confront your friend about their eating it's imperative you do so in a kind and calm way. Pull them aside. Task them when they are alone, it's quiet and safe. It's normal for them to get defensive and annoyed, stay calm. Reassure them you want them to be safe, happy and healthy. If they deny all your claims and you still have concerns it's important you don't let it go. Talk to a trusted teacher or parent about your concerns who will be able to get your friend the help they need. I hope you guys found this post eye opening and helpful. Eating disorders can affect anyone of any age, sexual orientation or gender. There's a lot more to eating disorders than being skin and bones. You shouldn't delay if you are concerned about a friend. You could save their life. This is such an important blog post. I suffered with an eating disorder when I was 23, it wasn't specifically bulimia or anorexia, just a combination of all. 4 years on it's still hard. 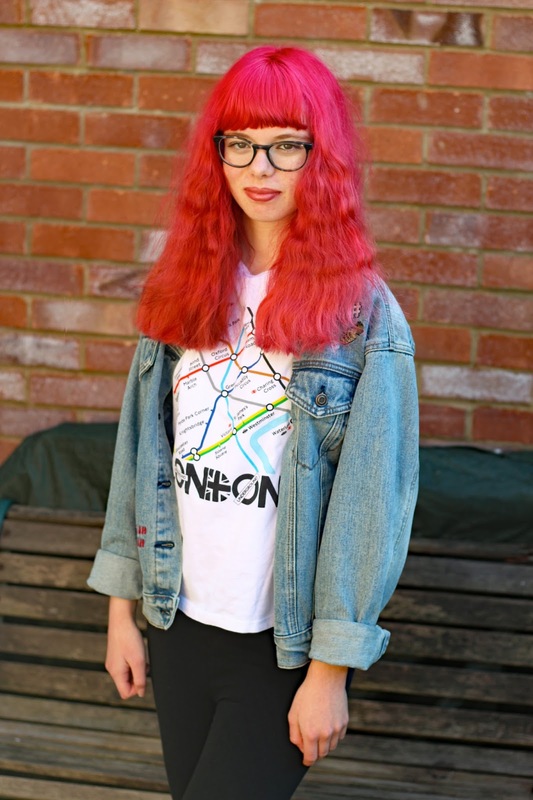 Such an important blog post Nicole, I've had a bad relationship with food in the past due to my anxiety and emetophobia, at one point I was quite badly underweight. I never even considered it to be an eating disorder, however looking bad it most certainly was, as I was cutting out certain foods, and stopped eating certain types of food groups all together. So important to raise awareness for this! It just goes to show how undereducated we are in subjects like this because I didn't know what EDNOS was until you explained.. This post really informed me of a lot, I had no idea about that eating disorder. Great informative post! 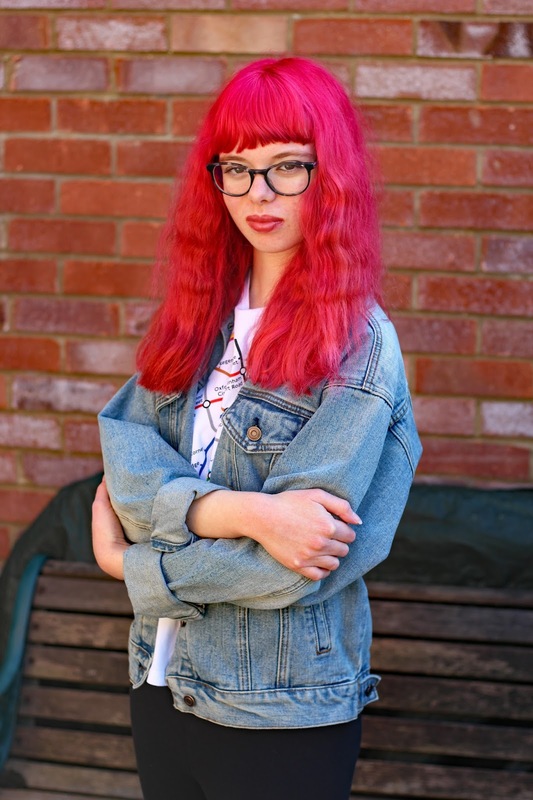 This is such a great post, thanks for sharing your personal story and raising awareness of what EDNOS is like. We can't always 'see' a eating disorder! I love this post and how you are raising awareness for EDNOS. A lot of people think eating disorders are always visible and your post really highlights how they aren't! Keep writing great awareness posts like this! You're the only person I've ever seen post about an eating disorder, never mind EDNOS! I had and probably still do to some extent EDNOS, but no one took it seriously when I was a teen, when people found out it was put down to "attention seeking" or a "phase", and it's sad because you'd have to be literally on deaths door for anyone to really notice or it to be considered a big deal. Great post and really important that people start talking about all mental health more often!